Last year Julian Fellowes read the poem for National Poetry Day. It held particular resonance for him because of his own mother. In honor of my Mom, I wanted to bake something I know she would have liked. She was especially fond of bread and pastries and would rarely turn down a butter roll or fruit danish. I’d never made a danish; it always looked too complicated and time intensive. But what about something that called for store-bought puff pastry? After all, I was happy with how Paddington’s Apple Tart turned out. Hmmm, a little internet sleuthing and I stumbled upon a Peach Cream Cheese Braided Danish at Natasha’s Kitchen. Just as she said, this danish looks fancy but is deceptively simple to make — which means it’s perfect for an Easter holiday brunch, especially if you’re having last-minute guests and you’re short on time. Very pretty and festive on the table and oh, so good! You basically need just three key ingredients — a 15-oz. can of sliced peaches, 6 oz. of cream cheese, and a box of frozen puff pastry. Oh, I can hear the purists among you right now: “canned peaches? !” “store-bought puff pastry? !” Well, hopefully you know by now that we’re not food snobs here, and as we approach near fossilization dignified maturity, we’re happy for shortcuts. You can always make your own puff pastry from scratch (but with good quality frozen out there why would you want to?) and use fresh peaches, but I couldn’t guarantee that your danish wouldn’t turn out too oozy-juicy. Besides, I love the 50’s vibe of canned peaches — remember how Ramona Quimby’s family always had canned fruit for dessert? I especially loved those peaches and my mom always seemed to have them on hand. If Beverly Cleary can vouch for them, so can I. So, I first drained the peaches in a colander, then sliced them in half so they were about 1/4 inch thick. Then I made the cream cheese filling by beating together 6 oz. softened cream cheese, one egg yolk, 1/2 tsp vanilla, 1/2 tsp lemon juice, and 1/4 cup sugar. Next I rolled out the puff pastry to make a slightly longer rectangle about 1/4″ thick. I spread my cream cheese filling down the middle third of the pastry, then arranged my peach slices on top. I clipped off the top corners of the dough, cut notches on the bottom edge, then cut 1″-wide strips diagonally along each side (forgot to take a photo as I was so excited to start braiding). To form the braid, I then folded the strips over the filling, alternating sides. After brushing the pastry with an egg wash and sprinkling on a little brown sugar, I transferred the danish onto a cookie sheet and baked it for about 25 minutes. The recipe calls for parchment paper — rolling the dough on it would make it very easy to transfer everything onto a baking sheet later — but I was out of parchment, so I substituted non-stick foil and it worked out fine. After the danish cooled completely, I made the simple confectioners’ sugar and milk glaze, then drizzled it on. Oh my goodness! This was soooooooooo yummy — lightest, airy flakiness, melt-in-your-mouth buttery, and there’s just something wonderful about the combination of peaches and cream cheese. All I know is, puff pastry is my new best friend. It’s simply magical! The full printable recipe can be found at Natasha’s Kitchen. I highly recommend watching her video so you can see how easy this recipe is, and you can see how she braids the pastry. Have a fabulous holiday weekend, friends! Poet, Author, and Stray Kitty Finder Amy Ludwig VanDerwater is hosting the Roundup at The Poem Farm. Hop on over, take her a piece of peach danish and check out the full menu of poetry goodness being shared in the blogosphere today. I worry that fresh peaches might have too much juice that would ooze out of the pastry while baking — but it’s worth a try as I love fresh peaches :). The footed plate dates back to the 70’s — I got it when I lived in London (it’s made by Carlton Ware). It can even stand! Sorry to hear you lost your mother at such a young age, Brenda. My mother lived to be 89 and had a good long life. Your daughter is welcome to help herself to those virtual jelly beans. The bears and bunnies send their best wishes and hugs :). I have memories of my mom from when I was four, and she was a goddess, I wouldn’t trade them. I’m glad your mother lived so long and created the magical you! I’m going to try that peach danish, Jama! Your comment about “near fossilization” made me laugh. I’m afraid to click on the video of Julian Fellowes because I figure he will make me cry. Sending you a hug! Yes, Julian’s reading is tear-inducing — and he talks about his mother afterwards which makes it even sadder . . . Happy to hear you’re going to try the danish, Tabatha! Lots of yumminess for so little effort. Oh, peaches. Fresh ones make summer bearable, but I also like them canned, frozen, and dried, so I think I would love your peach danish! I remember when I was young we used to get canned freestone peaches. Then, when they started canning fruit with less sugar, you were only able to get cling peaches canned that way. The freestone ones are packed in heavy syrup, which is too bad, because I think freestone have a better taste. I’m glad for fruit canned in juice rather than heavy syrup, but I’m not “too” disappointed that freestones don’t come that way. I remember my mother buying them at times and I didn’t like them because they were too hairy. They could have tasted better than the other kind but what’s up with that fringe? Thanks, Melodye! Happy Easter to you! Jama – This is such a sweet and sad post both. I adore that you baked something your mom would like, and I think I will bake this for my mom. Thank you. I know that I always say this….but you just weave pictures and food and kindnesses so artfully. Happy Poetry Friday, and may your April be full of unexpected surprises. xo, a. Thanks for your sweet, kind words, Amy! Glad to hear you plan to bake this for your Mom. Whenever this time of year rolls around, I think back to those Poetry Potlucks and your famous pineapple slices recipe. Will your family be enjoying that this weekend? A beautiful poem by one of my favorite poets, Jama. It resonates with me, too, as I lost my mom two and a half years ago and miss her every day. 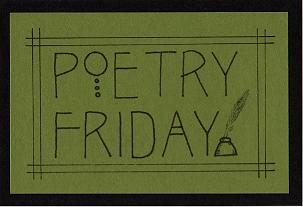 Happy National Poetry Month back to you! Didn’t realize Rossetti was one of your favorites, Toby! Guess no one ever stops missing a parent — it takes some major emotional readjusting to a new reality, doesn’t it? It’s comforting and reassuring to know that the good memories, the things that really matter, have such staying power. You do gain a good sense of perspective. What a lovely poem to remember your mother by, Jama. And I am so glad that you now think of her as strong and energetic–I remember the relief I felt when I realized I was remembering my mother as she was before her illness. Oh canned fruit for dessert–that was my mother and Ramona Quimby’s mom’s standard. And thank you for the congratulations!! Nice to hear you have the same experience of remembering your mom when she was in good health — proof that the vital essence of a person never dies. Thank you for the beautiful poem, Jama. April is special to me too because my mother’s birthday is April 10th. I’m always remembering how much she loved springtime, & planting the garden. You made this Danish look so easy that I’m going to have to try it. My husband would have loved it, too. His favorite fruit was always peaches, in the flesh, pies, any where! Thanks for a loving post. It’s hard to believe it’s been a whole year since your mother died. Hugs to you. Thanks for the hugs — the year passed quickly, didn’t it? Nice to know your husband loved peaches so much and that this time of year is filled with fond memories of your mom’s love of gardening and springtime. Sounds like you definitely take after her :). Wonderful poem, and wonderful looking danish! I too was thinking of a danish for Easter – maybe though with a lemony-cheese filling…. Saw some recipes for lemon ricotta danish that looked interesting. Might have to try that next! Jama, thank you for the poem. When I think about my father I always think when someone dies you miss them forever. Not every moment. But always. Darling, let NO ONE disparage your store-bought puff pastry or your canned peaches – any Mama for whom this was made would eat this with joy – and so they should. It’s BEAUTIFUL. May the memories of your mother always bring joy. Meanwhile, that poem got several things in my eye. Been listening to Beltshazzar’s Feast, the performance of which we did around Easter in Glasgow, and the soaring baritone solo, If I forget thee, O Jerusalem, may my tongue cling to the roof of my mouth… is just so poignant – that’s about missing a homeland, of course. I agree so much with the sentiment of the poem that the softening of forgetting is better than the heart-convulsion of continued grief. Thanks for the support! My Sis the expert just confirmed that fresh peaches would give off too much liquid, so my hesitation was justified. Yes, I think the poem gets it right. Reassuring to know it’s as true back in Rossetti’s time as it is now. Yay, glad you feel the same way about store-bought puff pastry (so many possibilities, so little time), and Ramona, whom I love!! Happy Easter! Oh my goodness, Jama. You got it all in here. Your lovely mom, Danish, Rossetti. And Ramona! So very sweet. Happy spring. Happy Spring to you and Steve — enjoy the weekend!! In Myra’s post this week, Wendell Berry reminded me not to “tax (my life) with forethought of grief,” but I couldn’t help but begin again to dread my mother’s passing. Now reading your words and hearing John Fellowes read this poem, I know that mixed with my pain, there will be lots of joy remaining, and I am better able to take Berry’s advice. It’s very difficult not to dread the passing of loved ones — I think it’s human nature to always think ahead like that. Part of our dread may be not knowing just how we’ll react, as everyone grieves differently. You can have all my black jelly beans. I never cared for licorice (I was a red vines/whips girl when I was little). Your mother-in-law sounds like such a special person — I like knowing that she would have approved of canned peaches and that she loved danishes :). Sending ((hugs)) your way this month as you think of her. Hope you had a good Easter, Uru — drooling as well as feasting :)! Jama, thank you for Rosetti’s poem and the fond remembrance of your mother that made me think of mine today. Easter always reminds me of the Easter lily plant she bought for the house (my plant bloomed today) and the magnificent crosses she created out of sacred Palms (I put the ones she gave me out every year). The dessert you created in honor of your mother would have intrigued mine who was an amazing baker. How yummy your recipe looked throughout the process but the photo of the braiding was splendid. Unfortunately, there were no delicious recipes at my table today-the stomach bug invaded our house and although this was the tail end, a bland diet was the fare of the day. This bug also is delaying Winter Whisperings from being unveiled. (PS: I rarely look at Word Press so you replies to me were not viewed until yesterday.) I will let you know when I am ready to unveil the Gallery so you can post it on the month’s calendar. Thank you. Sorry to hear about the stomach bug, Carol. Thanks for sharing your thoughts about your mom’s Easter lily plant and the crosses she made. Just let me know when the WW Gallery is up and I’ll update the listing. Feel better soon! Hugs to you dearest Jama. Your mother sounds like a formidable and beautiful woman who was the light in her family’s life. To be that loved is a gift. I just shared the youtube link to dearest husband who promises to at least try doing this (he is looking over my shoulder as i type). You’re lucky to live with a talented cook — I’m sure your husband would find this recipe very easy to pull off. Perfect with a cup of tea :). That is a really moving poem. My great-grandfather passed on 2 years ago, and I still think of him, even though I never really knew who he exactly was in his prime. Time is a trickster for sure. Hope you like the recipe. Thanks for the comforting wishes :). I never ever imagined I could make a danish, but you make the impossible seem possible for this short-cut loving lass. Sending love your way as you celebrate, with each delicious bite, the strong and beautiful presence that your mother enjoyed in your life. This recipe is definitely possible, Michelle. If I can, you can! This is beautiful Jama. I love that you baked to honor your mother. I still have my mom but she has dementia. She is known by family and friends for her cooking and she still remembers enough to be sad that she isn’t the “main” cook nowdays. I was with her earlier this year and we made apple dumplings together. It’s a simple recipe that she can still handle with just a little guidance. The poem is touching. Thanks for sharing it. I’m glad you’re still able to share some good times with your mom in the kitchen. Mmmm, apple dumplings!